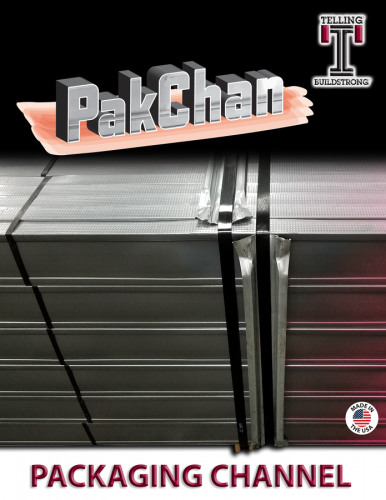 PakChan packaging channel replaces traditional wooden channel typically used for shipping metal framing. It features roll formed and hemmed edges with swedged ends to prevent cuts and abrasions while loading. The benefits include better shipping stability and tighter banding which reduces shifting during transit. PakChan has improved strength and durability and won’t split or crack like wooden packaging channel can. PakChan is patent pending and is currently being used in Telling’s Cambridge, OH plant. It will soon be rolled out in Osceola, AR and Windsor, CT plants as well.